Fortunately, not all systems are affected by this regression. When testing a Lenovo ThinkPad W510 with an Intel Core i7 720Q CPU, 4GB of RAM, 160GB Intel SSD, and NVIDIA Quadro FX 880M graphics. Additional details can be found on OpenBenchmarking.org. 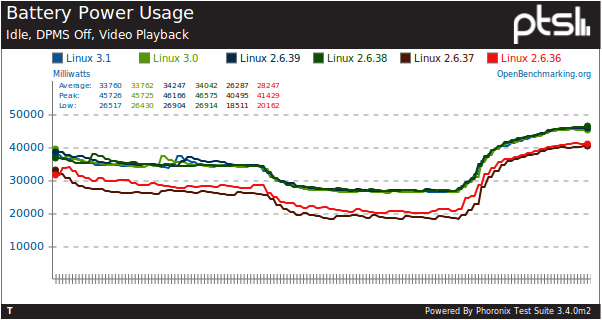 This older Intel quad-core notebook didn't see any power regressions on the Linux 3.1 or 3.0 kernels, but the Active-State Power Management change in the Linux 2.6.38 kernel is still causing this mobile beast to have its power rate elevated by 29%. The Linux power regression for the Intel Sandy Bridge notebook on the Linux 3.1 kernel is still being investigated and so stay tuned for updates. Live updates on the research are also often shared via Twitter.